Well, apparently the Associated Press isn’t educating their video reporters on bee topics any better than New York public schools are teaching their kids. This report on a bee swarm, which says that employees at a video store were “trapped” in the shop for hours because of a swarm shows a complete lack of understanding about swarm dynamics. Bees don’t sting very often, and they really don’t sting when swarming. So the video unfortunately feeds into the general ignorance about bees in NYC, where beekeeping is inexplicably illegal. 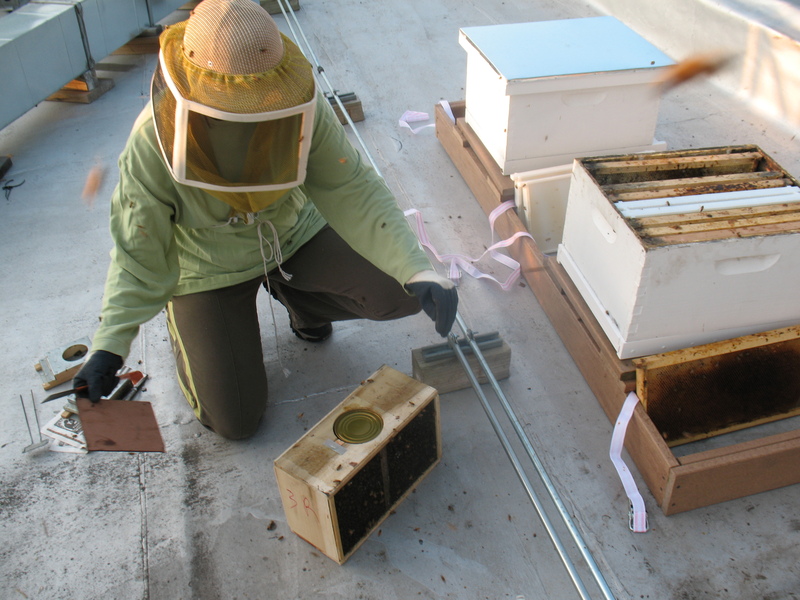 Helen installing one of our packages of bees. Well, we’re back in the bee business, so to speak. Sorry for the delay–not that I have too many people reading this, given the paucity of posts in recent months. But I was finishing the index for my book at the same time as I was getting the hives set up. We got the packages on Saturday, May 9, and installed them a couple days later. There was a complication, in that the supplier had sent us two queenless packages. Perhaps I could have waited a couple days to install the queenless packages, or asked for full replacements. But what we ended up doing on the spur of the moment was combining the queenless packages, getting new queens from the supplier and then splitting the two hives. Splitting the hives meant that we had to put them somewhere else, other than the rooftop where the two earlier hives are. So Helen’s taken them to her house temporarily, and they’re doing fine there. So, more to come. But wanted to update this and get things started for the spring. Oh, and by the way, the new bees have Russian queens, and appear to be pretty Russian themselves. When I split the hives, I found them even more docile and easy to work than the Carniolans.